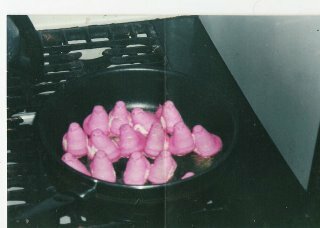 I know it's a little soon to start planning, but I just got excited about the possibility of a 2nd annual BC06 Easter Potluck. Are we having one? If so, who's hosting? Will Ricky bring Heidi Klum gummi's again? What are people bringing? I'll volunteer Yoni and myself to make the famous Woody family egg casserole. A. Paul, that's the funniest picture I've ever seen you exhibit. What's the origin? B. I dont' remember a brunch potluck for Easter last year, was I there? C. I really would like to do something like that this year. I will make my own homemade sausage (not really). I loved our easter egg hunt brunch last year - this year though, my dish is going to involve some Passover. Where/when do you propose such brunching/hunting? Billy and I would be happy to again host the 2nd annual Easter BC06 brunch club. We will have Billy's Russian door prizes along with the Heidi Klum candy. i plan to furnish deviled eggs. Whether the Executive uses the Aircraft alone or joins others using the Aircraft for bona fide business purposes, the value is calculated the same. IF YOU EVER WANT TO SEE YOUR LITTLE FRIEND LUXMUNDITO AGAIN -- ALIVE -- you must send interesting articles to me to read. LUX is trapped in a Hell of my own creation, but I am there too. IN ORDER FOR LUX TO BE FREE, I need to fly. SO MAIL ME or LUX DIES here, far from civilization, on this heathen coast. fake morse code SOS here! it smells bad and everyone's burning for christ! heeeeeeeeelp me! send TPIS what he wants! it's the only way he'll feed me! anything! please help! and his little dog wormie too! Aksionov. He had two shops and a house of his own. married he gave up drinking, except now and then. start to-day; I have had a bad dream about you." fair I shall go on a spree." you took off your cap I saw that your hair was quite grey." out all my goods, and bring you some presents from the fair." and then went to bed in adjoining rooms. him to put in the horses. cottage at the back), paid his bill, and continued his journey. out his guitar and began to play. business of my own, and there is no need to question me." cut. We must search your things." out of a bag, crying, "Whose knife is this?" him, and how much money you stole?" Ryazan, and robbing him of twenty thousand rubles. them all with her, she went to the town where her husband was in jail. long time. Then she drew her children to her, and sat down near him. him. He told her all, and she asked, "What can we do now?" your wife the truth; was it not you who did it?" appeal, and from Him alone expect mercy." he was driven to Siberia with other convicts. laughed, but he often prayed. right, and to judge the matter. his wife and children were still alive. towns or villages they came from, and what they were sentenced for. downcast air to what was said. telling you; I've been to Siberia before, but I did not stay long." anything of the merchants Aksionov of Vladimir? Are they still alive?" Gran'dad, how did you come here?" said, "For my sins I have been in prison these twenty-six years." _own_ knee, and exclaimed, "Well, this is wonderful! Really wonderful! But how old you've grown, Gran'dad!" "It's wonderful that we should meet here, lads!" affair, or maybe you've seen me before?" long time ago, and I've forgotten what I heard." so wretched that he was ready to kill himself. Semyonich, nor even look at him. was so miserable that he did not know what to do. they'll flog the life out of me, but I will kill you first." not, as God shall direct." betray Makar Semyonich, knowing he would be flogged almost to death. would it be to me?" been digging under the wall?" me; I am your hands." the matter had to be left. the darkness and recognised Makar. want? Go away, or I will call the guard!" "It was I who killed the merchant and hid the knife among your things. knife in your bag and escaped out of the window." slid off the bed-shelf and knelt upon the ground. "Ivan Dmitrich,"
can go to your home." dead, and my children have forgotten me. I have nowhere to go..."
that I am!" And he began to sob. forgive you!" said he. "Maybe I am a hundred times worse than you." for his last hour to come. From the original Luxmundito mamacita: Ha ha ha Ha Ha Ha Ha Ha Ha - what a pissa!!!!!!!! i am going to amend my contribution from deviled eggs to champagne & mixer juices. once again, choosing money over time. sigh. Let's say 12:00 at our place. See you soon. lux, you scared everybody away.